Messrs Williams and Sowerby already had a large shop when Tallis came round (±1839), but they were to make it even grander in later years. This will be a blog post with lots of illustrations and not so much text, because this post is more about the building than about the history of the people who occupied it. It had all started in 1828 when silk mercer John William established his Commerce House at 61, Oxford Street. Joseph Sowerby was taken on as the junior partner and the gentlemen set out to make their shop the best place in town to obtain “silk mercery, haberdashery, hosiery, gloves, ribbons, laces and general drapery”. 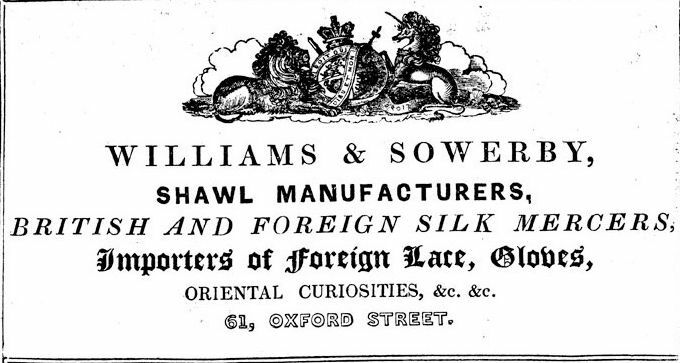 This listing of their wares appeared in an advertisement in The Caledonian Mercury of 21 April, 1838, in which Williams and Sowerby introduced their agent J. Thomson, who sold their stock in Edinburgh. 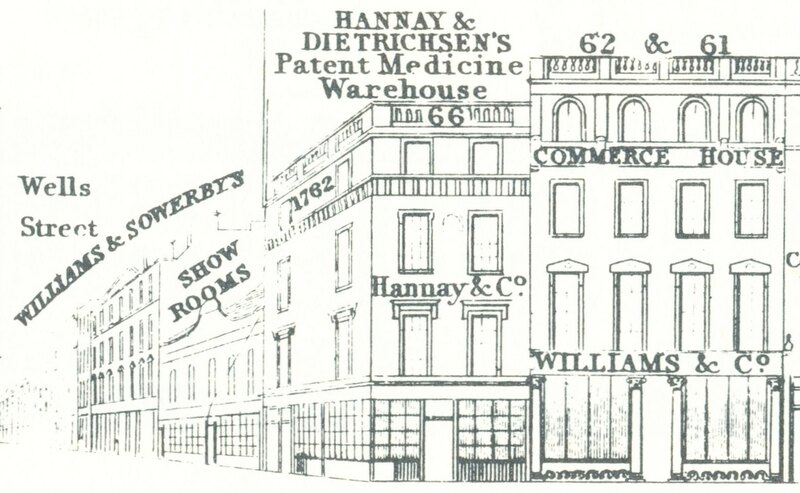 The advertisement also tells us that by then, that is ten years after they started the business, the London shop already encompassed 61 and 62 Oxford Street, as well as 3 and 4 Wells Street, around the corner. Williams and Sowerby spent some money on their entry in the Tallis booklet, as they not only entered two advertisements, but also a vignette, and a generous depiction in the street plan, not to mention the write-up that Tallis supplied. The premises on the corner, the patent medicine warehouse, was number 63, not 66 as the street plan incorrectly states. Williams and Sowerby were no doubt frustrated that they could not manage to buy that property as well, as that would have meant a nice straight building site for the refurbishment they had in mind. However, they did manage to obtain number 60 on the other side of Commerce House as well as 5 Wells Street. An item in The Belfast News-Letter of 3 April, 1840, copied information from an “Edinburgh Paper” on ‘glass cloth’. One Mr. Clarke had shown this new material at the Assembly Room in Edinburgh. Glass cloth was invented in Paris, but was “now manufactured by Messrs Williams and Sowerby, who are reported to have expended about ten thousand pounds upon the patent and requisite machinery”. The material consisted of very thinly spun glass, which was interwoven with silk. It could be used for curtains, but also for dresses and “has graced the ball-room at Almack’s and the Tuileries”. Williams and Sowerby called the material ’tissue de verre’ and in 1844, The Art-Union (p. 195) explained that the finely-spun glass material was not brittle at all, as one would expect of glass, but very flexible, and used to make material that looked very much like brocade. 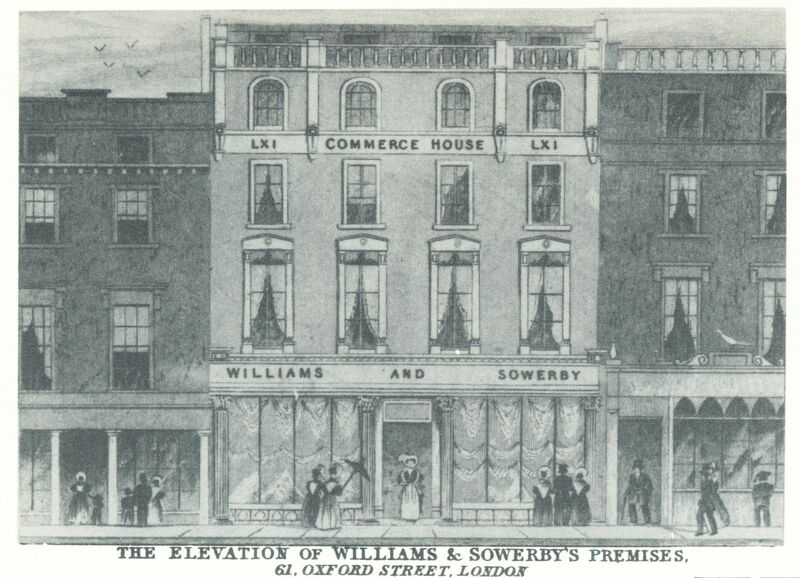 1844 was also the year in which Williams & Sowerby opened their renovated showrooms. 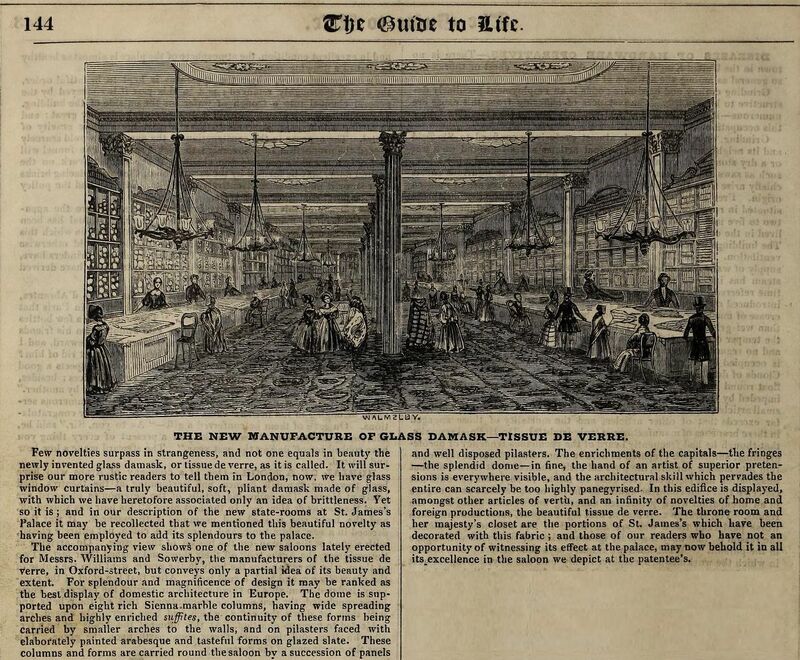 The Guide to Life included a picture of the showroom and a nice write-up, also mentioning the ’tissue de verre’. Although the dome that was described in The Guide to Life could not be seen in the accompanying illustration, The Mirror of Literature, Amusement, and Instruction included one that showed this marvel. The Mirror praised the architect David Mocatta (see here and here) “for the happy adaption of the site, its lofty height, the forms of the design, and its enrichments, and more especially of the beautiful mellow light which pervades every part. 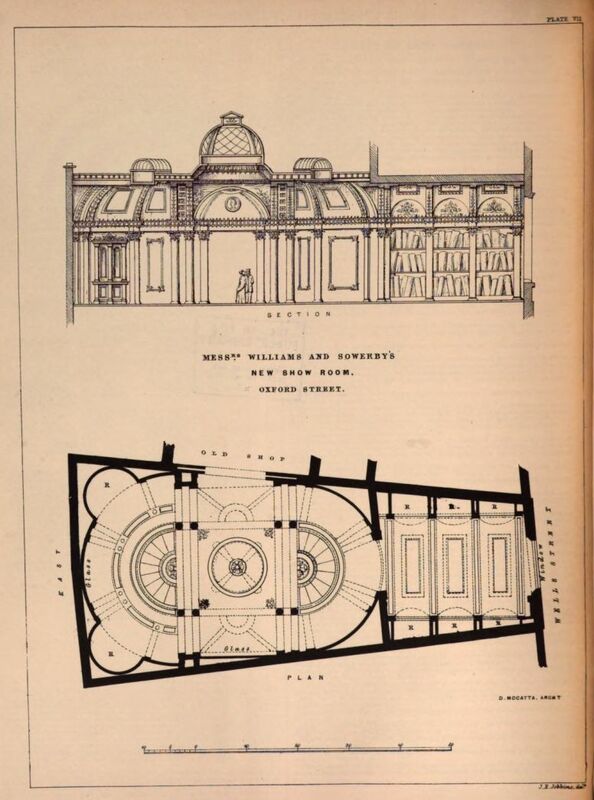 The original form of the ground called for much ingenuity on the part of the architect, as next to Wells-street the width is only 25 feet, and at the back it is 43 feet wide; this difference is concealed by the arrangement of the circular parts of the two ends”. 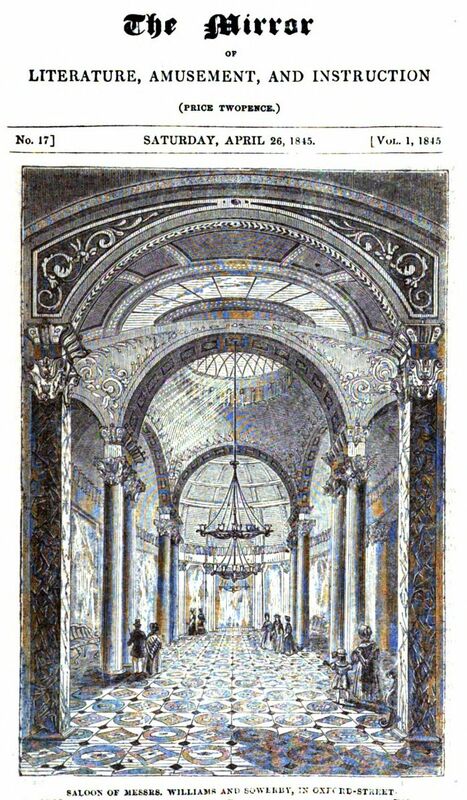 The Civil Engineer and Architect’s Journal included two plates; one to show the design of the new showroom, shown below, and the other the decoration on the columns with which they were not entirely pleased (see here). 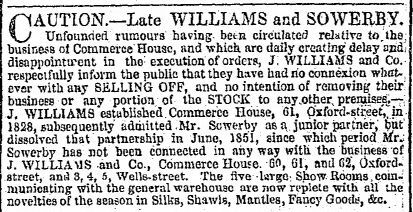 The partnership between Williams and Sowerby was not destined to last as in 1851 a notice appeared in The London Gazette to announce that they had terminated their partnership with Williams to continue on his own. Although the entry in The Gazette speaks of “mutual consent”, an advertisement in The Daily News of 25 April 1853 seems to suggest something else. 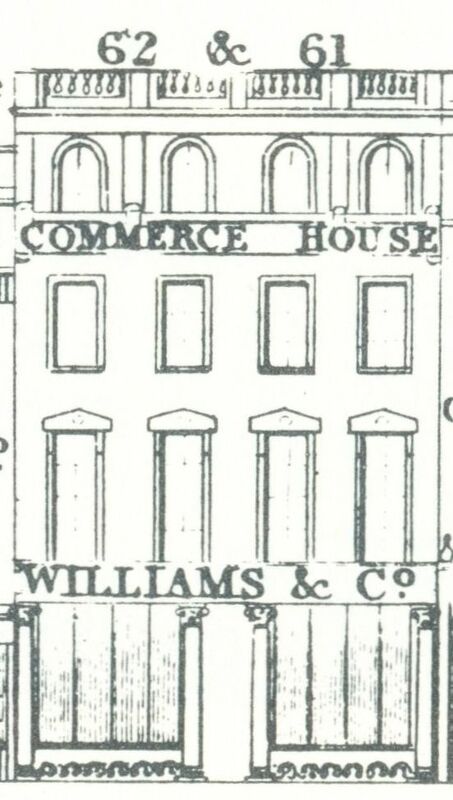 The large building Williams and Sowerby constructed with the help of David Mocatta did not survive the century and was replaced in 1894 by a new building that was to become Bourne and Hollingsworth’s Department Store. For more on that building see here. (1) The Morning Chronicle, 19 September 1843 and The Standard, 25 September 1843. (2) Thanks go to @2nerdyhistgirls, @ladymissalicia and @sarahmurden for finding these references. John Baddeley was the brother of Charles Baddeley who had his shoe shop at 130 Strand. His nephew, also a Charles, first had his shop in Fleet Street and later at 119 Oxford Street. But in this post we will concentrate on John and his son George who had their bootmaker’s business at 48 Oxford Street. John was baptised as an adult at the Independent Chapel in Marshall Street on the 29th of April 1831, but the record tells us that he had been born on the 2nd of December 1769. Why he had himself baptised so late in life is unclear, nor do other members of the family seem to have followed him. John had already been baptised in 1793, along with several of his brothers and sisters, at the Baptist chapel in Keppell Street. In 1797 John married Charlotte Cordell, the younger sister of Ann Cordell who had married Charles Baddeley senior in 1792, thereby forging a double family link. When comparing Horwood’s 1799 map with Tallis’s Street View, I noticed a slight discrepancy in the numbering. Starting from the corner of Oxford and Berners Street, the first five properties are numbered 54, 53, 53, 51, 50 in both resources. Logic dictates that the next property is number 49 and that is what Horwood shows, but Tallis had Baddeley at number 48, next to number 50. Later Post Office Directories (1851 and 1856) list 49 & 50 together as one property, so that may be the explanation why Tallis does not show 49. But that is not all. If we follow the numbers from the other side, that is, the corner of Newman Street, both Tallis and Horwood have 40, 41, 42, 43, 44. Then Horwood has a double property with numbers 45 and 46 and Tallis just has 45. Horwood shows a small alley going to Timber Yard at the back where we find number 47; the house numbers in the street jump from 46 to 48 on either side of the alley. Tallis misses out number 46, but so do the tax records from ±1830 onwards and the later Post Office Directories. The Land Tax records show, from at least 1792 onwards, a continuous numbering from 40 to 54 with numbers 46 and 47 often bracketed together for the same occupant. 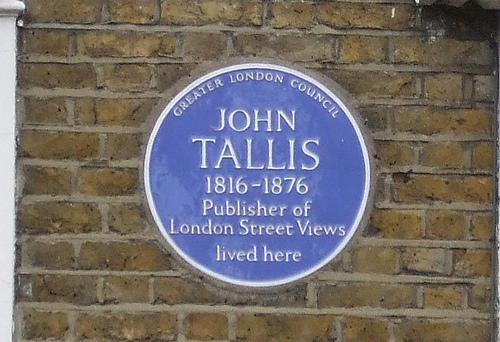 The index to the Tallis Street View does not help very much as numbers 42, 43, 44, 45 and 51 have no names attached and were presumably empty at that time. Tallis shows Baddeley’s property with two doors, one of which, the one on the right, may very well have been the old entrance to Timber yard. In 1888 when Goad’s insurance map was produced, the open ground at the back of the houses, including Timber Yard, had more or less been filled in completely and the alley towards the back can no longer be seen. Besides that, the numbering changed and numbers 40-54 became 90-114 with Baddeley’s number 48 turned into 104. We can see the changes in Baddeley’s finances by looking at some later insurance records. The value of £200 on the house is increased in 1828 to £237, although a confusing entry in 1817 for one Richard Barnet lists 48 Oxford Street, which he insured for £600 as “in tenure of Baddeley a shoemaker”. 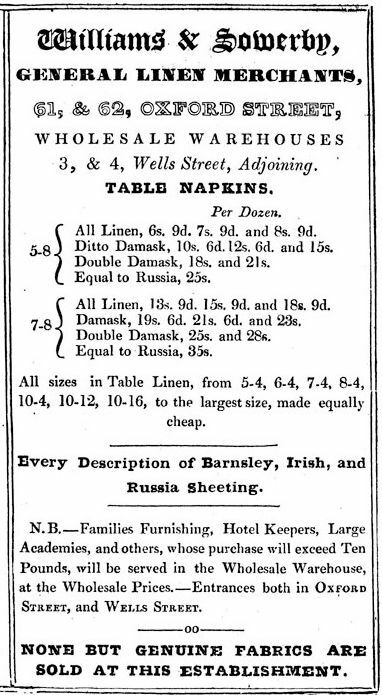 Baddeley’s household goods for some reason decrease in value from £350 in 1805 to £220 in 1828. The value of his stock and utensils vary a bit from £550 in 1805 to £580 in 1814 and £500 in 1828. From 1814 onwards, however, Baddeley also insured a property in Great Russell Street, Covent Garden, occupied by a grocer, for £600 (£680 in 1828). In 1828 the rent he receives for that property is £63. The 1841 census still has John Baddeley, his wife Charlotte and two of their daughters, Charlotte and Elizabeth, at number 48, but a year and a half later, a notice in The London Gazette of 27 December 1842 tells us that John is terminating the partnership with son George. George could be found as a bootmaker at 2 Upper King Street in the 1848 Post Office Directory and at 521 Oxford Street from 1850 onwards. In June 1850, George registered a design for a boot (no. 2335), describing himself as “naval and military boot maker”. He was doing well for himself and the 1851 census lists him as employing 20 men. In the 1848 Post Office Directory, John can still be found at 48 Oxford Street, but by the time of the 1851 census John, Charlotte and their two daughters have moved to 20 High Street, with John listed as “proprietor of houses & dividens (sic.)”. Charlotte died in 1852, 74 years old, and was buried at Abney Park, Stoke Newington, where John was to follow her three years later. (3) He was then living at 12, Kingston Russell Place, Oakley Square. (3) Abney Park, Grave Number 007675. For no apparent reason, Oxford Street 88 and 89 are depicted in both the Street View booklets 34 and 36. Why there was a repeat in number 36 is not clear; the shops were shown quite clearly in number 34 (see the elevation above), while in number 36 they were drawn across the map that Tallis provided on the left-hand side of the page, which looks very messy and not at all how the rest of the booklets were produced. One reason could be that Cubison’s neighbour wanted his shop more prominently displayed in a vignette which could not be included in booklet 34 because someone else had arranged that spot before him, so his was depicted in number 36. 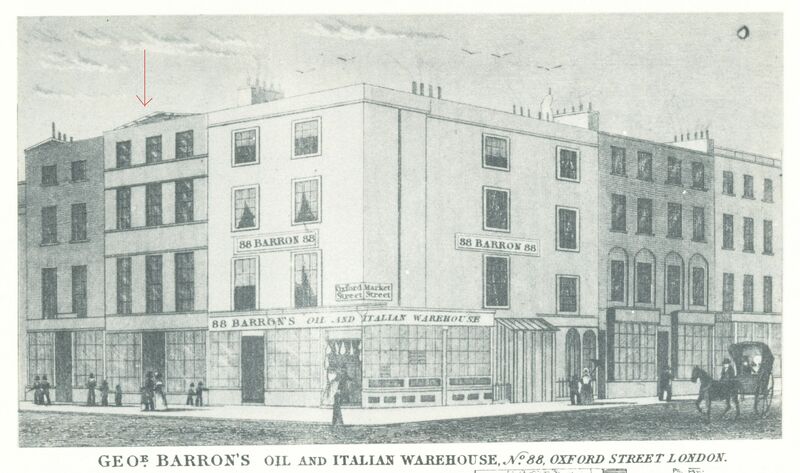 Fortunately for us, that vignette also shows the Cubison shop, to the left of Barron’s. Mrs Elizabeth Cubison, a widow, depicted herself as a hatter in the Street View booklets, but in the 1841 census, she is listed as a milliner. In the census, she lives at Albion House, 89 Oxford Street, with her three daughters Jane, Lydia and Harriet, all milliners. In the 1841 Post Office London Directory, however, number 89 is listed to William Henry Cubison, a hatter, and, on the next line, but with the same address, we find Mrs E. James, leghorn, chip & hat manufacturer. William Henry is easily explained as the son of Elizabeth Cubison, but Mrs James is somewhat of a mystery. Further up the street, at number 95, we find one J. James, leghorn, straw, & bonnet manufacturer. Were they related? The census does not help as neither of the Jameses lived above the shop and the name is not an easy one to search for. 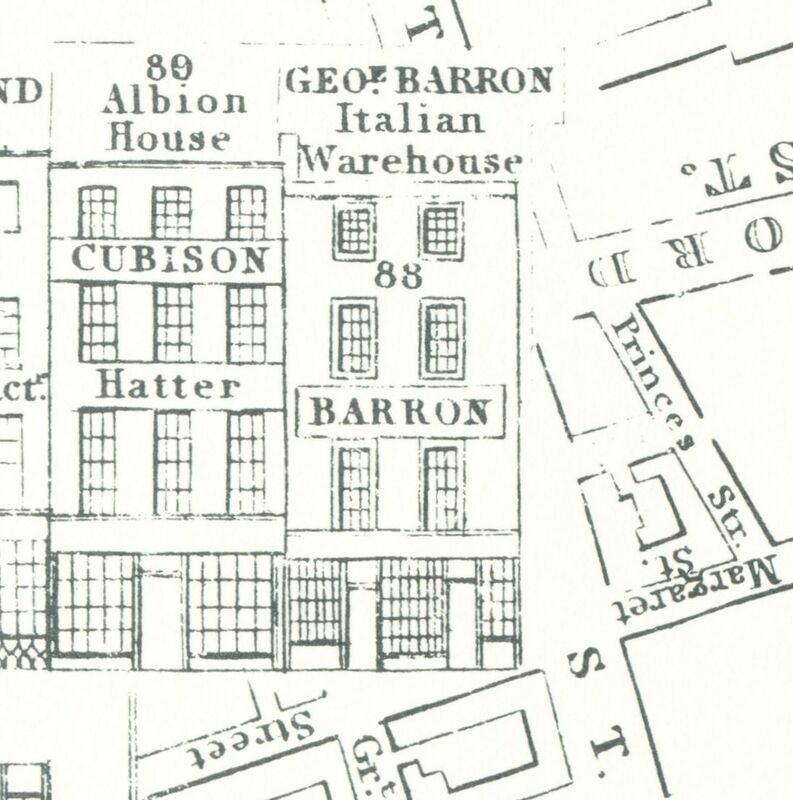 In the 1845 Post Office London Directory there is just one entry for “James & Cubsion, milliners & straw bonnet makers” at number 89, suggesting a partnership. 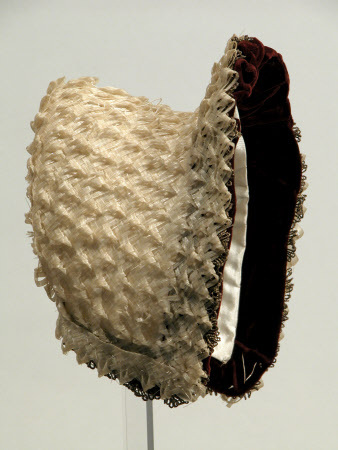 See below for a picture of a straw bonnet in the National Trust collection and they are as confused as anybody else about the James and Cubison partnership; they call the maker ‘Cubison, James’ as if it were his first name. We’ll come back to a member of the James family later on, but first the Cubison family. Elizabeth Goldsmith married Richard Cubison on 25 November 1817 at St. Anne Soho. The couple had seven children: William Henry (born 1814), Jane (born 1816), Mary Ann (born 1817), Harriet (born 1820), Lydia (born ±1821), Frederick John (born 1823) and Richard Marsh (born 1824); the four eldest children were baptised at St. George’s, Bloomsbury and the two youngest at St. Anne Soho. The baptism record for Lydia has not been found yet, but judging by the other available records, she must have been born around 1820. Richard died intestate in October 1829 and administration was granted to Elizabeth. We know for certain that Richard had a straw hat manufacturing business in Oxford Street in October 1819 when Elizabeth testified in an Old Bailey case concerning dodgy money received from a customer(1), but he may also have been in the Navy. I will come back to this and Richard’s unsavoury character later. After Richard’s death, Elizabeth continued the business, possibly in partnership with (Mrs E.?) James, but in her will (she died in March 1856), she leaves the business to her daughter Lydia and her daughter-in-law Charlotte Louisa, the wife of son Richard Marsh. The two ladies do indeed continue the shop, although it appears from some advertisements that the whole family was involved in the straw hat and millinery business. In 1852, for instance, the Post Office London Directory lists Frederick and Richard as lacemen at 89 Oxford Street, but also – separately – Mrs Elizabeth Cubison as milliner for James & Cubison. Advertisements in The Times of 10 January and The Observer of 14 January, 1855, name “Messrs. 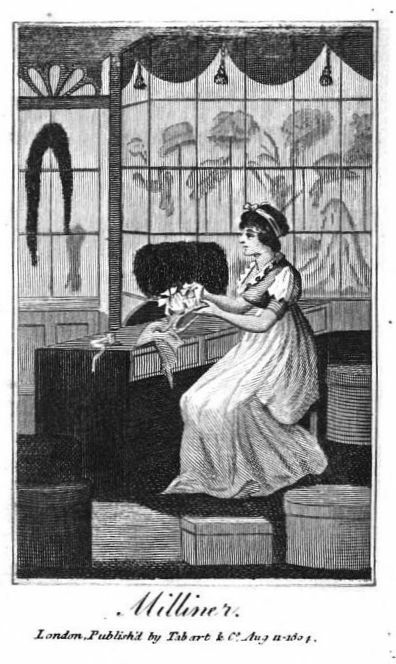 F. and R. Cubison” as the source of a stock of lace available at a large discount. Was the lace business of the brothers perhaps separate from their mother’s millinery shop which she had in partnership with James, but were both businesses run from the same address? 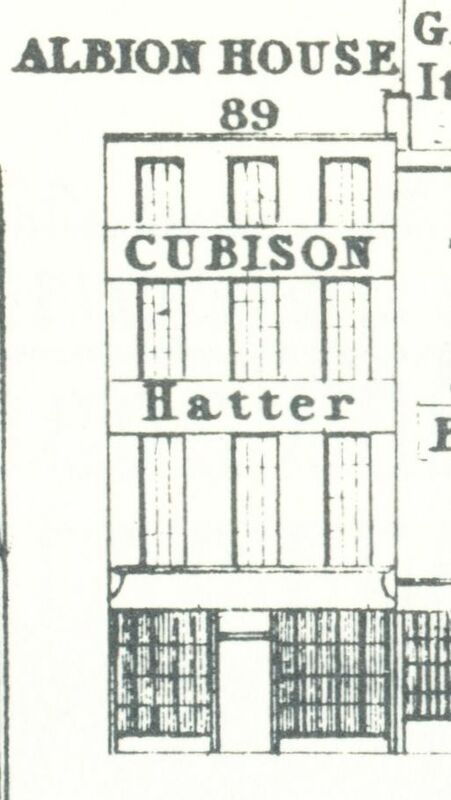 It would appear so, as on 17 April 1856, a notice in The Times announces that James and Cubison have filled the shop “with the latest novelties from Paris by their French milliner” and that “the business will still be continued by Miss Cubison” in a way the customers were used to “for upwards of 35 years”. And now back to where it all began, Richard Cubison. He was born around 1788 and baptised in Aldington, Kent as the son of Stephen Cubison and Mary Ann Marsh. In 1823, Richard, hat manufacturer of 89 Oxford Street, is accused of assault by Bessy Pennythorne. Cubison stands bail. (7) I have not seen the actual documents, so do not know the details, but it may not have been the first time that Richard was not able to control himself. In 1816, an inquest was held into the death of Sarah Rapps who committed suicide by hanging herself. (8) At the inquest, a witness claimed that Cubison, Sarah’s brother-in-law, had frequently beaten and ill-treated Sarah and her sister, Cubison’s wife Elizabeth, but Cubison denied that. Mrs Cubison’s evidence, however, “was a material difference from that of her husband”. The verdict was “that deceased came to her death by hanging herself in a fit of lunacy” and no charges seem to have been brought against Cubison. Now, I cannot prove that we are talking about the same Cubison in these two assault cases. The first one involving Bessy Pennythorne definitely involved Cubison, the hatter, but the second case involving Sarah Rapps poses problems. Yes, Cubison is an unusual name and there are not many Richard Cubisons around at that time; yes, he had a wife Elizabeth, although they were not officially married until 1817, but they did already have children together. His wife’s last name was Goldsmith, not Rapps, but the women may have been half-sisters. Or is Elizabeth Goldsmith his second wife? The marriage registration of 1817 does not say whether either of them had been married before. So, questions remain, not only about the assault, but also about Richard’s work in the Navy. On the marriage record for daughter Lydia, the father’s profession is given as R.N. and that was not the only instance. In the Gentleman’s Magazine of 1872 in which daughter Jane’s death is announced, she is described as “daughter of the late Captain Cubison, R.N.” and in 1864, the same magazine, announcing the death of son Richard Marsh, also called the father “Capt. Cubsison, R.N.” And the same happened in 1851 when the magazine announced Harriet’s marriage to John Mathers. This can no longer be a mistake. Richard senior must have been in the Navy while his wife conducted the millinery and hat-making business. Could it have been a part-time job? I do not know anything about the Navy and have no idea if one could combine a business in London with the work aboard a ship, or was it just a case of simply him being the official proprietor of the business while in fact his wife ran it? I have found a list of ship masters where Richard’s seniority is listed as 28 June 1809, but that does not help much. (9) Can any of my readers help? (1) Old Bailey case t18191027-70. (2) England & Wales, National Probate Calendar (Index of Wills and Administrations), 1864. His estate is valued at under £450. (3) London Gazette, 7 January 1881. (4) England & Wales, National Probate Calendar (Index of Wills and Administrations), 1905. Estate valued at just over £1027. (5) England & Wales, National Probate Calendar (Index of Wills and Administrations), 1887. Estate valued at just over £4974. (6) England & Wales, National Probate Calendar (Index of Wills and Administrations), 1901. Estate valued at just over £7422. (8) The Examiner, 8 September 1816. (9) A List of the Masters, medical Officers,and Pursers of His Majesty’s Fleet, 1827, p. 9.